Managed accounts are a booming sub-set of the hedge funds industry: in the 12 months to June 2012, assets in managed accounts grew over 15%. Similar growth is expected over the subsequent 12 months. It is not hard to see why many large hedge fund allocators prefer the managed accounts route when they can get it, and why several of the big banks and asset managers have seen their platforms expanding rapidly in terms of both AUM and overall investment options. In the wake of the 2008 liquidity crisis, managed accounts, with their higher levels of transparency, have offered investors the ability to exert higher levels of control and look-through to end assets, increasingly critical components of tightened risk management protocols. 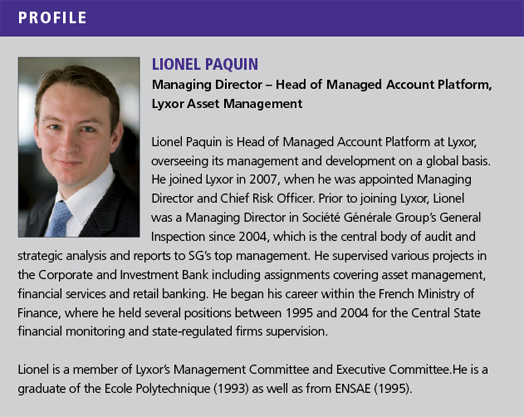 Arguably the largest managed accounts platform in the field is Lyxor’s offering, which forms part of its larger alternative investments menu, including funds of funds and alternative indexing. Launched in 1998, it now has over $11 billion in assets. There are a number of important ingredients that are required in the recipe for any successful managed accounts offering, and Lyxor ticks the boxes in all areas. These include a team and a process that is able to select the right managers for the platform, a high level of fraud protection (e.g., via segregated assets), and enhanced due diligence processes. Superior liquidity – often weekly in the case of the Lyxor managed accounts – also helps. Security is a key ‘sleep at night’ benefit of Lyxor’s platform – Lyxor ensures that its investor clients will not be exposed to operational or fraud-related risks. Sure, the end manager might be taken out by such a crisis, but the assets on the platform are fully segregated, the managers have to adhere to trading limits, and NAVs are calculated and completed independently. The whole structure is serviced completely independently from the investment manager, ensuring operational integrity and avoiding conflicts of interest. Lyxor draws heavily on its institutional pedigree and 15 years of continuous operations to offer robust and scalable infrastructure coupled with enhanced transparency and comprehensive reporting. It is also well positioned to support newcomers to managed accounts and indeed hedge fund investing, and can provide an additional level of advice and consultancy where required. It represents one of the larger managed accounts platforms offering access to external managers, rather than being first and foremost an internal platform. Technological development is an important feature of the Lyxor platform’s ongoing development. Web delivery of the service has allowed for the migration of monthly reporting to weekly, and Lyxor is optimistic that eventual daily reporting may be possible. This will bring risk analysis into line with more liquid asset classes, and give investors scope to react to performance and risk issues far more quickly than was previously the case. The level of transparency now available even allows some kind of ethical overlay, letting investors ensure fund managers are adhering to SRI criteria. This is important as there is an emerging demand for hedge fund managers to meet ESG/SRI rules, as imposed on long-only funds. Ongoing operational oversight is an integral part of the overall attraction of a managed account platform. For Lyxor it is essential that managed accounts and their managers are subject to a process of continual operational evaluation. Beyond this, the team at Lyxor is also alive to the universe of additional funds it keeps track of, with a view to expanding its range. It is important never to stand still in this industry and Lyxor takes pains to enhance its service on a continuous basis. In 2012, further innovations were added to its client interface, including online portfolio management tools and regular commentary and research covering the managers and strategies on the platform. The objective is to provide investors with a fuller experience supporting the bread and butter fund monitoring and reporting components. It is part and parcel of what Lyxor sees as the characteristics of the most advanced managed accounts platforms – i.e., far more detailed and granular reporting and analysis served up as part of the customer interface. There are two ways to look at the performance of hedge funds on the platform – as asset-weighted investments (and therefore equal in performance to the HFRX Index) or from the perspective of what portfolio managers can do with such a universe. Lyxor’s own funds of funds have been able to deliver superior returns – e.g., the Lyxor Focus fund delivered 6% in 2012 and 10 alternative strategies out of 13 were in positive territory, with three strategies delivering double-digit returns. All these features come into their own when investors are seeking to rebalance their portfolios and aggregate their exposure figures: institutional investors are allocating across a wide range of different markets and liquidity profiles today, from listed shares on the one hand all the way through to private equity and real estate on the other. To enable an investor to have an accurate idea of his total exposure to hedge funds on a managed account platform and readily available for integration into his overall risk analytics package is a major boon. High levels of transparency have also been introduced, with instrument level portfolio reporting. It is another area in which many hedge fund managers have adapted to investor needs. Lyxor is now able to provide this information to those clients who wish to feed their own risk systems with detailed portfolio information. On the cash management side, notional funding – cash-efficient exposure to cash-rich strategies like CTAs and global macro – is a common requirement for institutions and banks seeking to optimise funding across their investments. Lyxor has launched a notional funding format for one of its CTAs this year and plans to roll this out over other highly liquid strategies to provide over-leveraged versions of these funds for investors seeking exposure without high levels of cash commitment. These are the fruits of a busy year for Lyxor, which saw 2012 as an opportunity to prepare for growth and development. If anything can be said to be changing quickly in the world of managed accounts, it is the demand from investors for less liquid strategies in the managed account wrapper. In Lyxor’s case this has meant adding strategies that might not necessarily meet its one-week liquidity profile, but it senses that some clients are prepared to surrender this facility in return for the right strategy options. Managed account platforms like Lyxor’s are extremely well positioned to meet what is likely to be a continuing demand for the benefits these types of fund offer, particularly from those investors that lack the scale or the resources of some of the larger allocators. It represents the cost-effective route into managed account investing for a great deal of investors approaching direct hedge fund portfolio management for the first time. Paquin says the overwhelming theme this year will continue to be the increasing institutionalisation of the business, which will be a guiding theme for Lyxor. Institutions are searching for yield, appreciate optimisation/customisation, and are also fighting for fees.